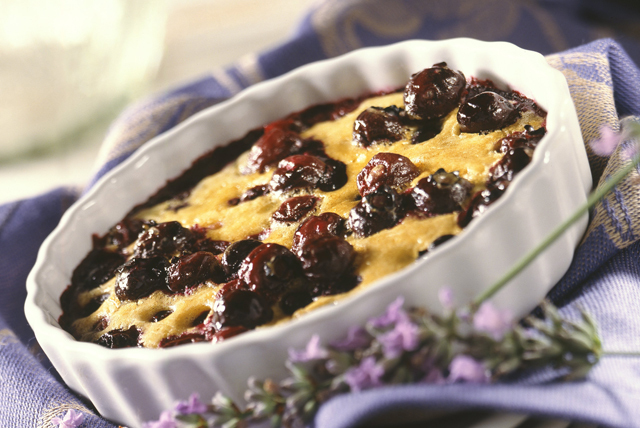 Traditionally made with cherries, this custard-like French dessert is even easier to make with fresh blueberries. Brush butter onto bottom and up side of 9-inch pie plate; sprinkle evenly with 1 Tbsp. sugar. Add blueberries; spread to evenly cover bottom of prepared pie plate. Blend eggs and Cool Whip in blender until blended. Add flour, zest and remaining sugar; pulse 30 sec. or until blended. Pour over blueberries. Bake 20 min. or until toothpick inserted in centre comes out clean. Remove from oven. Heat broiler. Broil dessert, 6 inches from heat, 2 to 3 min. or until top is puffed and golden brown. Cool slightly. Substitute blueberries with sour cherries. When serving adults, add 2 Tbsp. orange-flavoured liqueur to prepared batter before baking, if desired.